Ramadan buffet business hours : 6.30pm to 1.00pm. IT IS highly uncommon for restaurants and hotels to conceptualise a Ramadan buffet focusing on Thai food, but Pacific Regency Hotel Suites Kuala Lumpur’s Soi 23 restaurant is looking forward to something different this time around. During a special preview recently, members of the media were given a glimpse of what’s to come this Ramadan. Chef Suphakit Khammungkhun and his wife Phichamon Khammungkhun have created an interesting Thai menu, from appetisers to desserts to dazzle diners. After a day of fasting, diners can choose to refresh their palate with an array of juices before starting with the appetisers and soups. I would personally recommend the Thai Tea, that is refreshing, cold and delicious and goes well with the Thai soup, Tom Yam Kung. Tom Yam Kung is by far one of the best soups I have tasted but unlike the ones we usually get at Thai restaurants. Suphakit’s concoction is a little different as the recipe is from his village in Ubon Rachathani, North East of Thailand. “Most kitchens use chillies but I use chilli flakes and I add spring onions as it gives it a new flavour,” he said. 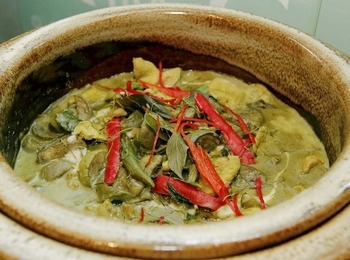 There are the usual favourites like the Thai Green Curry Chicken as well as the Squid Sambal with Petai. Suphakit uses chilli paste from red chillies and dried chillies as the combination creates an interesting flavour. There is also the Kangkung Goreng Belacan Thai followed by an array of ulams and spicy sambal. 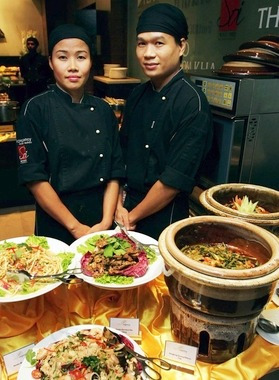 Enjoy your meal: Husband and wife duo Suphakit (right) and Phichamon have prepared a complete array of Thai dishes, ranging from appetisers to desserts. While the Thai section is unique at the Ramadan buffet this year, there are also a number of local traditional Malay dishes that will definitely bring back memories. Among them are Kerabu Nangka, Kerabu Jantung Pisang, Kerabu Sotong with Bunga Kantan for appetisers as well as the Ketam Masak Lemak Cili Api, Kurma Kambing Berkentang, Hati Ayam Goreng Kicap, Daging Goreng Kunyit and Pucuk Manis Masak Lemak Putih with Keledek. I enjoyed the combination of the Ketam Masak Lemak Cili Api with nasi briyani but it would have been better if Basmati grains were used for the briyani. The crab was succulent with myriad flavours. There are also live stations where guests can get fresh Ikan Bakar, Roasted Lamb with Rosemary sauce, Assam Laksa as well as Beef and Chicken satay. To cool our palate, there was ice kacang, cendol, tapai ubi and an assortment of Malay kuih. However, what caught my attention was the colourful Thai desserts, Med Ka Mun, Ka Nom Luk Chub, Ka Nom Foy Tong and Ka Nom Chan. Phichamon who specialises in desserts has gone great lengths to ensure diners get the real deal at her dessert counter. Made from mung beans, the desserts are actually difficult to make as it is time consuming and involves a number of processes. The Ka Nom Luk Chub, for instance, are colourful, cute little delights that are worth trying. The beans are steamed until soft then blended with coconut milk, sugar and salt before cooked over a slow fire in a wok for 30 minutes. Then jelly powder is added to help the chef design the little balls into fruit-shaped desserts. Ka Nom Chan looks like our very own kuih lapis but is made from rice flour and tapioca flour giving it a translucent sheen. After adding the coconut milk and sugar, the flour is separated before different colours are added and each one layered to perfection. All the Thai desserts are not execcesively sweet, making it a perfect end to a scrumptious meal. The Ramadan buffet is priced at RM78++ on the first and fourth week amd RM88++ during the second and third week of the promotion which begins today until Aug 18 2012.